Hello Ladies and happy Halloween! Our November WiN meeting is happening soon and it is my pleasure to welcome WiN members Nancy Newton, Cheryl Evans, Susan Peirce and Deb Smith as our guest speakers. 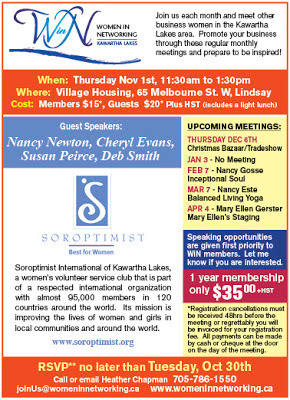 They will be talking to us about Soroptimist International of Kawartha Lakes. Full details below. Please let me know if you are planning to attend. A map link to the village housing building can be found here in the top right hand corner. 6. Heather Chapman - "My Graphic Designer"
Just a quick reminder that our October WiN meeting is Thursday, Oct 4th. 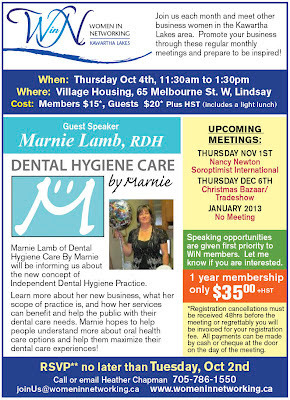 Our guest speaker will be Marnie Lamb, RDH of Dental Hygiene Care by Marnie. Please send me an email to let me know if you will be attending, full details below. 17. Barb Smith - Silver Connections Inc.